Why would one want to master CSS3 Colors? It goes down to a core question why should one control and know how to work with colors? Colors are at the very heart of display, graphics. It's critical for any developer or web designer to understand in-depth colors and their relations. This technical training aims to both introduce the ways you can control color using CSS3 features and aims to teach you how colors work so you can become more creative and gain more control over the style and design of your web sites and creations. This course is based on CSS Color Module LEVEL 3 Standards. This specification describes the color values and properties for colors in CSS. This standard incorporates values from CSS level 2 and new expanded values. This course is the perfect gateway to the world of colors in CSS. This course is easy, with a fast pace that cuts through the technical terms to bump up your CSS capabilities in less than an hour. By the end of this title, you will know everything you need to know about colors, how to work with them technically and creatively to create stunning and smart web pages. Learn how to work with colors. 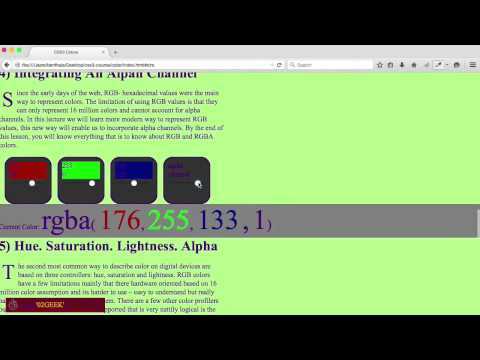 Understanding the way RGB, HSL, RGBA, HSLA and named colors work. Learn ways to pick great color themes. Working with dynamic colors in CSS.